Today’s Royal Gazette brings a good article on the government’s intent to create lasting benefit for Bermuda out of the America’s Cup. It also is a perfect showcase of a missed opportunity of the current government to properly communicate the benefits America’s Cup can bring and what they’re doing to improve things. The committee has been around since Sept 2015 and yet nearly a year later this is the first substantial mention of it. This is a squandered opportunity as they could be promoting it a great deal more and raising awareness. In the age of the internet it is rather shocking that communication and public awareness is not a much larger portion of initiatives like this. Creating even a simple blog to post updates would go a long way. Doing so allows you to empower the community to echo your efforts. Not doing so instead empowers the community to question your silence and doubt your efforts. There is a generally accepted rule of thumb that one should aim to spend no more than 30% of their income on housing. This rule of thumb helps provide an idea of what “affordable” should actually mean. In 2014 the median gross annual income for all job holders — in firms with ten or more employees — rose by 5 per cent to $63,897, up from the $60,668 for the year before. High median salaries included actuaries at $175,378, lawyers at $180,499 and auditors at $100,000. The average salary in the banking and international business sector was estimated as US$ 89,896. Ok, so $63,897 for the average worker and $89,896 for those in international business. Let’s start with the average worker. 30% of $63,897, taken monthly equates to $1,597.43 per month. Next, international business workers. 30% of $89,896 taken monthly is $2,247.40 per month. This would be a great starting point for defining “affordable” because it means that this is what the average person, spending along the rule of thumb of 30% of their income, can reasonably afford. These could then be doubled to consider what the affordability level is for a couple. So let’s return to the “Affordable Urban Living” development and compare it’s affordability. Admittedly the post was rather strongly worded as this writer tends to get worked up over housing affordability because it is the root cause of most of the island’s festering problems, but we’ll digress from that. Earlier this year the 7 Park Road project was reactivated with a starting price of $485,000 for a one bedroom apartment. It is touted as “affordable” by the developer, yet labeled as “luxury” by the newspaper. Is it affordable or luxury? Well let’s crunch some numbers. At a 0% interest rate, $485,000 taken over a 30 year term is roughly $1,347 a month to pay off. This is of course before considering condo and maintenance fees. Arguably, this could fall close to the rule of thumb calculations for the average Bermudian income and certainly falls within the mark for an international business worker. Unfortunately, a no interest loan is fantasy. So let’s try again, this time with a 6.5% interest rate more indicative of Bermuda’s mortgage rates. 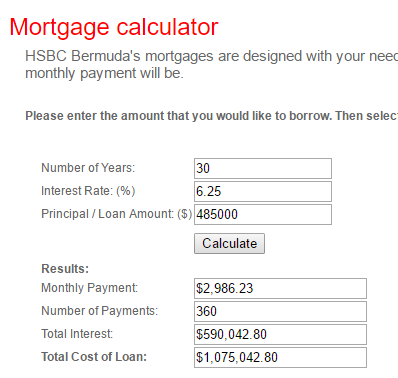 We’ll use HSBC’s mortgage calculator to figure out the details. Aside from the rather horrid fact that you’d pay more in interest than you would in principal, even at a very long 30 year term you’d be looking at a monthly payment of $2,986.23, far beyond our rule of thumb affordability. So, who can afford this? Well someone would need to earn $119,449.20 a year for this number to fall within the 30% rule of thumb, and again, that’s before considering maintenance fees. So, does this development measure up as affordable or luxury? Perhaps affordable if you’re employed as a Lawyer or an Actuary. Sadly not so if you’re anywhere close to average income levels, even as an international business worker. So what could be considered affordable? For the average worker, at $1,597.43 per month, likely a $200,000 place would be affordable with a 30 year, 6.5% mortgage of $1,350, leaving $247 spare for maintenance fees. For the average international business worker, at $2,247.40 per month, a $300,000 place would be affordable with a 30 year, 6.5% mortgage of $2025.62 with $221.78 to spare for maintenance fees. This is the fundamental problem so few seem to understand. When one laments the lack of housing supply, people point to the many options available, usually far above the affordability rule of thumb. Bermuda housing is simply not affordable because supply has long outstripped demand and there is too much of a focus on luxury. In order for Bermuda to fix many of its issues there needs to be a concerted policy driven effort to reduce the cost of housing. Following New York’s initiative of embracing micro-apartments may be one way to help improve housing stock and affordability. The 7 Park Road development is a perfect illustration of the delusion that clouds our society. It is billed as “affordable urban living” and yet shows all the hallmarks of waste and excess that push prices up and make it anything but affordable. It demonstrates why cost of living is out of control and why we struggle to recover our economy. It is of little doubt that the developers and architects mean well but they simply are so disconnected from the reality of the needs of affordable living that it is truly saddening. 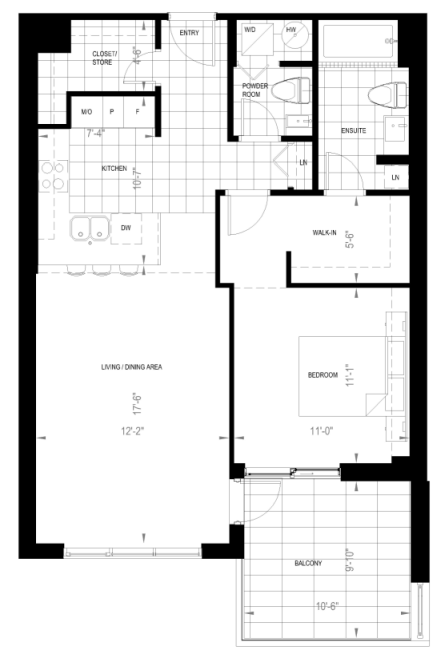 Here’s a sample floorplan for a C type unit of 793 square feet. Who honestly is the target audience of this apartment? Certainly it must target people with money to waste and is more deserving of the misguided “executive” label than “affordable”. Too many people think that there are an abundance of people with money to waste. There was a long trend where nearly every one bedroom apartment listed on e-moo was listed as an “executive apartment” for ridiculous rates. It’s sadly delusional. Let’s step back for a minute, skip the executive delusion and assume something more realistic. Let’s assume the target audience is young single professionals, both Bermudian and expat, who would either rent or buy. First off, most working young professionals spend a great deal of time in the office, often working late into the evening and then hoping to either relax or go out and do something after work. While personally I love to cook, most young professionals don’t have time to do a lot of cooking. A massive kitchen is an excess that adds a lot of expense for something that would be underused. It’s an unnecessary means to push up the price and make the unit less attractive. Then there’s the question of 2 bathrooms. Why would a young professional, even a couple, living in a one bedroom apartment need two bathrooms? That’s twice the cleaning and it suggests that for some reason they spend so much time entertaining that there is a need for a separate bathroom. Again, this is an excess that the vast majority of the time would be underused because it is unnecessary. It again pushes up the price and makes the unit less attractive for limited gain. Then there’s the overall layout, its huge. A large living room and balcony are nice to haves. Most would love to have large spaces but again, much of it would likely be underused. Large underused spaces push up the cost of buying or renting. They’re nice, but when you add each of these things up, it moves further and further away from “affordable”. Nothing about this development matches the “affordable” label they’ve put on it. It exemplifies waste and excess. This is a perfect example of the disconnect that Bermuda has with reality. We’re not catering to the real needs of the populace and instead catering to unrealistic daydreams. There is a false belief that everyone who works in international business is happy to waste the money they work hard for. This is why there are always apartments available to rent or buy in buildings like Atlantis and Dundonald, because few are interested in wasting that kind of money. What we really need are urban living options that are truly affordable. You don’t have to look very far for ideas of what that is. Take New York’s first micro apartment development as a great example: Carmel Place. Beautiful apartments that maximize usable space in the name of affordability. This is then blended with an innovative service called Ollie that aims to add some of the amenities and convenience of a hotel to everyday living that caters very well to the young working professional. You can literally fit two of these apartments in the space of one of the proposed 7 Park Road units. 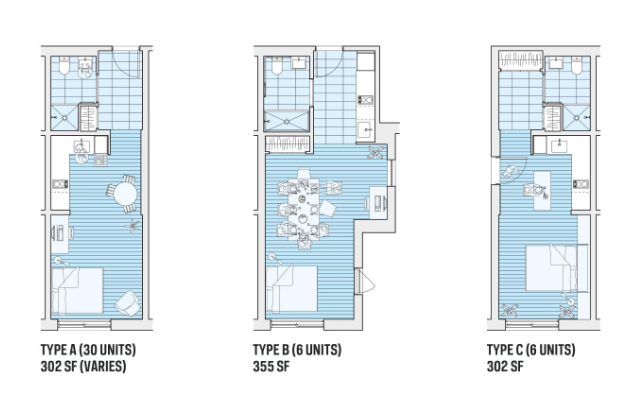 Here are some sample floorplans which maximize useable space and yet reduce the overall apartment size by nearly half. If the footprint is cut in half, hopefully the price could substantially be reduced making it more accessible for purchasing to live in or use as a rental. Bermuda needs to get realistic. “Affordable urban living” needs to actually be affordable. Housing remains excessively overpriced and as a result, our cost of living remains excessively high. It makes everything difficult. Town could readily house more people, more affordably, without straining the island’s infrastructure. Doing so could remove many of the roadblocks we have on the road to recovery. Sadly, we’re still delusional in embracing waste and excess rather than doing what it takes to deliver true affordability. Perhaps we need to consider embodying a public relations answer to the nonpartisan Spending and Government Efficiency commission to underscore how very interconnected and interdependent we all are within Bermuda’s fragile economic system. A blue-riband body comprised of political, corporate, labour and community leaders with a mandate to explain and to promote economic stability, reduce our vulnerability to internal disruptions and to encourage sustained growth and living standards by way of public hearings, televised and online sessions, and other traditional and social-media initiatives may be the most effective way to go. This is one of the big missing pieces of Bermuda’s political picture. So few people really understand the local economy, how it works, and how differing factors impact it. It has been suggested before, Bermuda fails to clearly explain the jobs expats create. That should be a top priority of any government wishing to really garner support for international business from the electorate. People lament and debate “trickle down economics” and claim it doesn’t work with little to no actual analysis. We should have a thorough review alongside a comprehensive PR campaign explaining exactly what the average expat worker contributes to the local economy. For example, the following charts should be readily available, explained and publicized. Every Bermudian should be made aware of the contributions expats make to our local economy. We need to combat the false belief that Bermudians should replace as many expat workers as possible. It is ludicrous to think that every Bermudian wants to work in international business. Instead, we should be doing what we can to attract more expats, provide them with reasonable housing so they don’t strain our infrastructure and as a result, create a more vibrant economy and a greater variety of job options for Bermudians. Singapore has recently announced real road trials of self driving taxi’s starting today. There are many examples of self driving mini-bus trials. These are the kinds of experiments that could have been perfect for Bermuda because we have a fairly controlled environment, potential legal flexibility and we make a perfect place for trials and modelling concepts. Yet, what real examples are there? Nearly none. Why aren’t we leading in any areas? Diversify [our economy] how exactly? Two companies based in New York, one in San Francisco. XL’s venture capital fund? It’s based in California. The question we need to ask ourselves is: what are we doing wrong? Why isn’t Bermuda a top choice for startups and innovation.